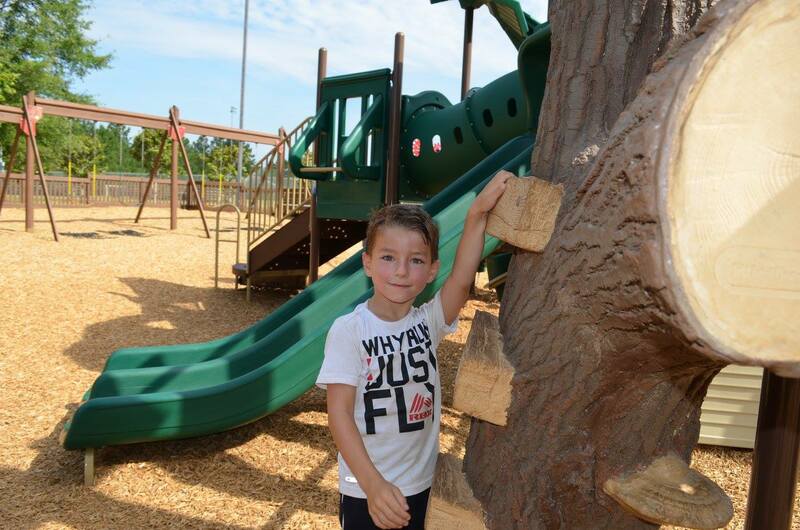 Kid Venture playground was built for the children of Anderson County through a volunteer organization, “Community Partners At Play.” The playground’s design features ideas provided by local children during community meetings with a design engineer. Anderson County donated space for the large wooden playground on an acre of land at the Anderson Sports & Entertainment Center. Community volunteers came together to build the structure. 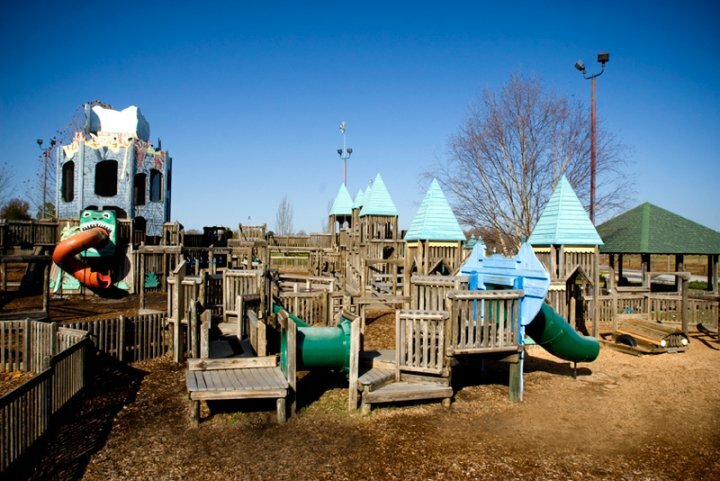 The playground is maintained by the Anderson Sports & Entertainment Center, other Anderson County departments and many local volunteers. Kid Venture is open daily for community children to enjoy. The age limit inside the playground is 12 years old. At times, the playground might be closed due to large events on the grounds of the Anderson Sports & Entainment Center. Food and drinks are not permitted inside the Kid-Venture play area. The playground closes each day at dusk. Because it is a community playground, neither Kid Venture nor its adjoining picnic shelter can be leased for private events or parties. Please dispose of trash properly. Violations will result in removal and possible fines for littering. If trash receptacles are full, please take your refuse with you. Do not use equipment when wet. When raining, the playground is closed. Rough play such as running, jumping, or shoving is not permitted. Inappropriate or indecent conduct, harassment and/or language prohibited. Do not harm wildlife in the area. Violations may result in possible fines. Defacing of park property, the playground, or picnic pavilion will result in removal and possible fines. Staples, nails, etc. are prohibited. Please keep the nearby restrooms in a neat and sanitary condition. Skateboards, roller blades, skates and other such items are prohibited in the playground area and on park grounds. Defacing of park property, including picnic pavilions, is prohibited. Pets are prohibited in picnic pavilion, playground or on athletic fields or courts. Where permitted on park grounds, pets must be on a leash and under control of the owners. Alcoholic beverages are prohibited in the playground area and on park grounds. Use of illegal drugs and weapons is prohibited. Interference with staff and/or volunteer duties is prohibited. No solicitation, loitering, vending, advertising or sign posting is permitted in the playground area or on the park grounds. Any other conduct that may jeopardize the safety of others is prohibited. Playground is patrolled by Anderson County Sheriff’s Office. Playground opens at 8:30 a.m. and closes at dusk, unless otherwise posted. Use of the premises other than during posted hours or when lights are off is prohibited. Playground and park grounds may be closed on certain days due to special events held at the Anderson Sports & Entertainment Center. Playground equipment for use by those 12-under only. Adult supervision required. Play at your own risk. Anderson County is not responsible for accidents or injuries incurred while using the playground. Playground equipment must be used in a safe and appropriate manner. The playground and picnic pavilion cannot be reserved for private parties. Picnic areas are first-come, first-serve. No food or beverages allowed in the play area. Glass containers in the picnic pavilion and park area are prohibited.